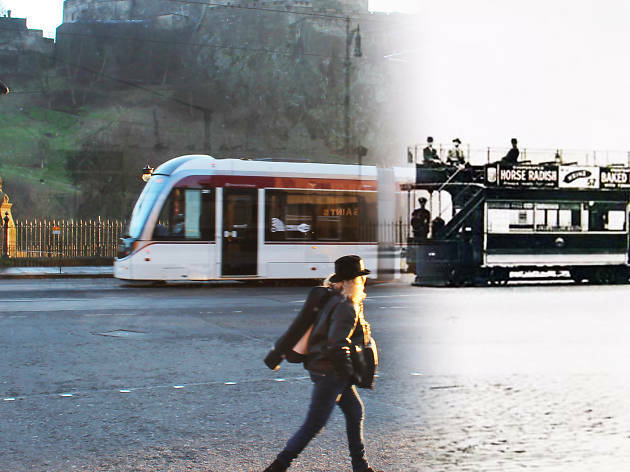 Depending on how much you use social media, you may have already seen Andrew Farris's spectacular 'now and then' images of Edinburgh, which juxtapose pics of modern Edinburgh with photos taken (and, occasionally, pictures painted) on the same spot sometime in the past. Farris has very kindly created some cross-faded images for use on our blog - you can see these, and more, images in all their fluid glory on his travel/history/photography blog On This Spot. On This Spot has its roots in Farris's love of history, which is a lifetime obsession - he attempted to write a technical manual on WWII tanks aged 12. His passion outgrew his hometown in Western Canada, 'a corner of the world without a long written history I could explore', so Farris set out internationally to explore 'the places where history happened, [to] see how time has treated them and see if I can think of anything interesting to say about them'. In addition to some striking photography, Farris's blog is also home to mini-essays providing readers with an introduction to, and context for, many of the images. We recommend taking the time to read Farris's comments while perusing the pics - he's not only blessed with a keen photographer's eye and a thirst for knowledge, but he's charmingly self-deprecating to boot. He insists in one caption that a particular piece of architecture 'hasn't moved, by the way, I just got the perspective slightly off'; in another, he helpfully shares the wisdom of a tourist who learned the hard way that Cockburn Street is 'pronounced Co-Burn'. You can see more of Farris's Edinburgh photography, as well as snaps from other locations around the world, on his blog, and follow his updates on Facebook and Twitter.